Camping and outdoor backyard activities are a summer must for the whole family. Our little family includes more just people though – we have a sweet playful dog, Bella and love s the outdoors just as much as we do! She’s a lab-mix that runs like crazy and loves to explore the woods. Between her and my active little boy, we spend a lot of time outside. One of the two of them is always begging to go out and play, which is fine with me because I love to be outdoors too! There is one problem with being in the woods, though… we have lots of ticks. For a while I felt like we were picking one off of our dog almost daily. Not such a good thing! Thankfully we have reduced the amount of ticks buy using this simple (and all natural) DIY Flea and Tick-repellent Dog Shampoo. It has helped tremendously, plus it’s nice to have a separate shampoo for our mud-loving dog. I’m not too keen on sharing the same shampoo bar I used on my own head, with the dog. While the dog shampoo helps, sometimes we need a little bit more to help keep the fleas and ticks away. I don’t like using the chemical tick goo that you can get from pet shops and vets. As with our human body products, I like to use a natural product for my dog. In addition to the tick-repellent shampoo, I’ve also started adding a flea and tick repellent essential oil blend to my dog’s collar. It’s easy to do and it’s very cost effective! Mix the first three ingredients in a shallow bowl. 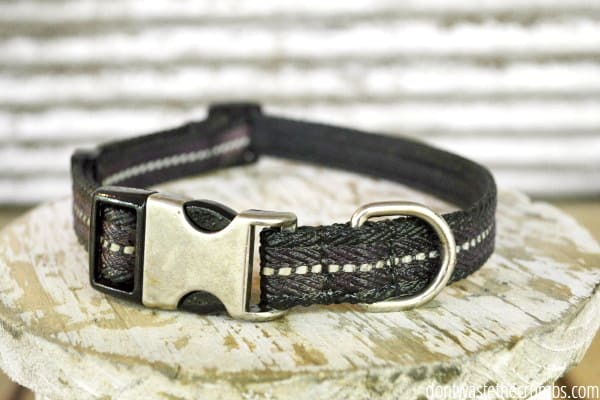 Soak your dog’s collar in the mixture until the collar is soaked through, about 5 minutes. Remove and let dry overnight before placing on your dog. Repeat monthly to keep the bugs away. See how easy that is? 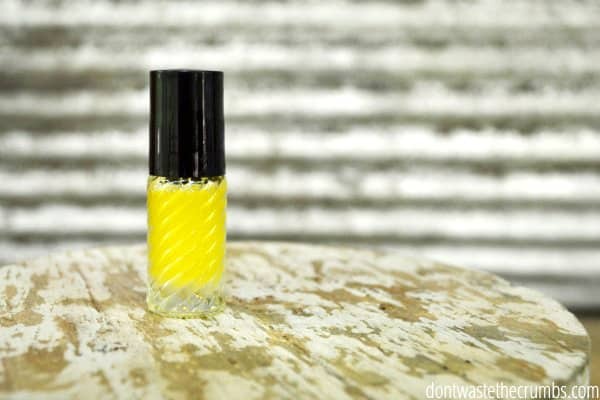 Now your furry friend can have a chemical-free flea and tick repellent! My favorite part is that I’m not worried about using this and then letting my little boy pet our dog. 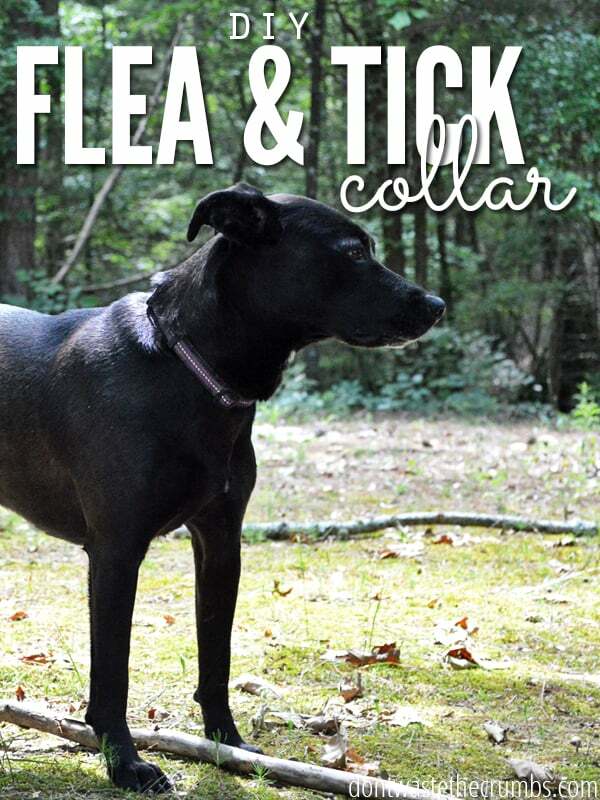 Many commercial flea and tick collars clearly have “keep out of reach of children” on the label, or are marked to “wash hands after handling.” I don’t have to worry about what chemicals are on our homemade flea and tick collar – it’s safe for the whole family! Note: Don’t use this recipe for your cats. Not all essential oils are recommended for for all animals. Use this chart as a guide. You know what else you could do if you have a high concentration of ticks in your area? Add this mix to a roller bottle or spray bottle and apply before going outside! You can give your dog a quick spritz when she heads out the door. Or, since it’s safe for the whole family, roll or spray onto you and the kids’ ankles to keep the ticks off. Ahh, I love multipurpose mixtures! Simplicity is nice. Do you use natural products on your pets? How do you keep fleas and ticks at bay, naturally? I found your site yesterday via Pinterest and LOVE it. Can’t wait to try many of your DIY’s, but toothpaste especially. DIY pest care for our dog was one of my searches too, you read my mind! I’m wondering once the collar dries does it continue to have a strong smell? We are new to essential oils and my family is accustom to fragrance free home products. I also don’t want my house to always smell like garlic. Thanks for the great info! Hey Beckey! The scent is fairly mild unless you are right up sniffing the collar. The garlic oil was masked by the essential oils so no worries! Enjoy all the DIY! Pardon my intrusion: I’ve heard that Tea tree oil is harmful to dogs. Right or not? i heard tea tree oil is good to keep ticks away??? is that true or is that certain oil not effective to keeping those suckers away!!!! melaleuca oil is the same thing as tea tree oil. Would this same formula work for cats as well? We have a cat and dog so will the cat be safe if I use this on the dog? The cat likes sleeping with the dog. I would love to use this on the dog. My understanding is its ok to use around cats, but not on them directly. Diffused or on your dog’s collar should not effect your cat. Hey Kim! If you are allergic to Lavender, I just suggest skipping it and utilizing the other EOs. They are all effective tick deterrents so one or all will work! I’m allergic to lavender, however, oddly enough, I’m *not* allergic to the EO’s. I’m not sure exactly how it works, but it is interesting. 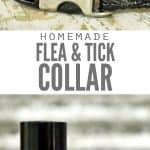 Do you have recipe for flea & tick collar for cats? Essential oils are not recommended for use ON cats. 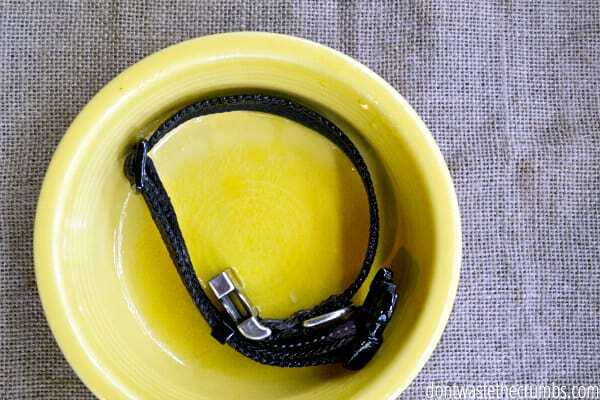 You may be able to use Apple Cider Vinegar and garlic oil for a cats collar. I have not done specific research on that though, so you may want to look into it a bit more. And as far as I do know, diffusing around cats is ok. Since EO’s are not effective for cats, – is there anything you’re aware of to use on cats that is not diffused. I don’t mean to start anything but I have been using and studying essential oils for alot of things for quite sometime, Mostly because I have Lupus & I have a grandson that is ADHD and learning disabled. There are so many wonderful uses for the EO’s. I use them for my small dog and do know that there are some oils that you really can. Yes ( you can) use on cats. I don’t know which ones I do know that melaluca can be fatal. But there really are some helpful you just need to study them and find out specifically. I would first probably google “What essential oils can I use on my cats?” Then take them one at a time and check into it to make sure. They are out there Good Luck.. If I get a chance to find out which ones are ok to use on cats I will post them. But remember for your precious cats sake to do your own homework. Always know in your own heart that your loved is safe. If all I have is tea tree oil and lavendar, do you think I could double up on those oils, skip the others, and still be OK? How often do you use the shampoo on your dog? For us, our dog gets a bath every few days in the summer since she is bound to jump into mud everytime we go on a walk. But I suggest to shampoo about once a week as long as it’s not drying your pets skin. As a veterinarian, I always check home EO remedies (and store-bought natural remedies) for tea tree oil, which is a neurotoxin in cats AND dogs. Cats are more sensitive to just about everything, but tea tree oil is a known neurotoxin in dogs too (probably dose dependent so higher risk in small dogs). Some types of cedarwood EO are toxic in dogs, according to the Learning About EOs website, which I love for a reference on which EOs to avoid in children and pets. Garlic is toxic if eaten, and I’m not sure how much garlic EO would be absorbed through the skin; again, probably dose-dependent. Pest repellents are tough; I tried desperately to use different EO blends on my kids when we moved to Virginia this summer, and while we saw no ticks, they got dozens of other bites in a few days, with at least one infected bite (luckily we resolved that without antibiotic). I totally understand the desire to avoid pesticides, but from the opinion of someone who sees tick and mosquito-borne diseases in animals, and who has an employer with long-term health effects from Lyme disease, I am more concerned about the diseases than the chemicals. Garlic is not toxic if given properly. It is actually quite beneficial. So are you saying this collar is NOT a good idea and dangerous? because of the garlic and tea tre oil? thanks for your help. Plant therapy has a bug repellent synergy made with only kidsafe essential. I made a bug spray with just that and witch hazel and water. My son is a magnet for mosquitos and he would walk outside to get in the car and have several bites. I spray this before he goes out and he can be out for hours and no bites. And I only spray his ankles and the back of his shirt. No staining. It’s awesome and smells like citronella which I love. We have 3 big dogs and we live on a river. Deer use the river as a highway. Deer are full of ticks and fleas. I have been giving my dogs apple cider vinegar every other day for over 4 years to eliminate fleas. Just a small dose, 1/2 teaspoon. No fleas but ticks yes. We will certainly try the EO on the collars. Easy was to get fleas out of your house and kill them is to use an attractant. It is as simple as turning all lights off in house at night and in each room display a small night light stuck in a socket. Under the night light place a baking tray with soapy water. The fleas are attracted to the light or the heat from light, hop up on light and fall into water. I am talking about a normal outlet about 10″ from the floor. The life cycle of a flea is, I think from egg to hatch, 3 weeks. So if you can do this for a month hopefully success. Do give ACV internally or topically? Thanks! Tea Tree oil and garlic are both toxic to dogs according to my research. I think I have all but the garlic oil. May I ask where you found that? Or do you make your own? Here’s a recipe for diy garlic oil. Is there a substitute for thyme Eoil, that would work as good? Or should i buy some thyme EO?